Strolling along a wooden bridge outside the new Student Success Center on Wright State University’s campus, one cannot help but admire the rolling sea of plants below. On a sunny day, “streams” of gravel crisscross underneath, bordered by fluffy green grasses, river birch trees and native flowers. But when it rains, the expanse is transformed as storm water diverted from the building’s roof and surrounding hardscape fills the depressions, creating ribbons of motion. Working like a sponge, the unique soil and plantings filter out contaminants and allow much of the water to slowly percolate back into the ground prior to being released off-site. The rain garden was designed as part of the construction of the new 67,000-square-foot Student Success Center, which the university will formally dedicate on Friday, Oct. 9, at 1 p.m. The energy-efficient building is anticipating a LEED certified designation by the U.S. Green Building Council. 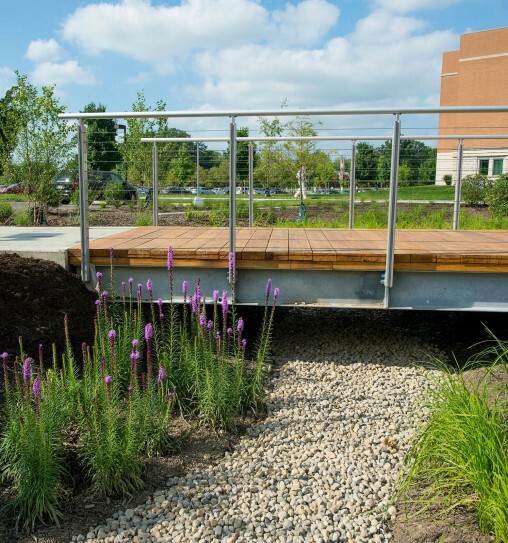 “The rain garden provides on-site storm water management for the building while highlighting Wright State’s commitment to sustainability,” said Timothy S. Skinner, landscape architect with EDGE, a Columbus firm specializing in planning, landscape architecture and urban design. 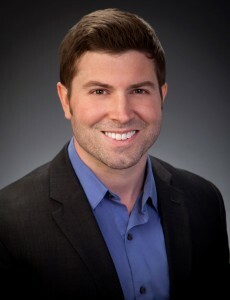 Environmental impact was considered throughout the project. For example, the bridge surface is made of a native black locust wood, in lieu of an exotic hardwood. Marsh blazing star (liatris) and green sedge flank the gravel stream of the rain garden. The landscape architects carefully chose plants to accommodate the varying levels of water inundation, as well as to provide year-round visual interest. Plants such as sedges, which thrive in wet soils, are located in the lower portions of the basin, while plants that tolerate both medium-wet soils as well as dry conditions, are placed along the banks of the basin. The rest of the basin is populated with pockets of plantings that vary in size, texture and seasonal bloom time. In the spring, Virginia bluebells and blue flag iris flaunt their rich hues. Later on, marsh blazing star and black-eyed susan punctuate the landscape with spots of color. Columnar Armstrong maple trees tower over the rain garden, casting shade for the benefit of users and nesting habitat for a variety of native bird species. Plants such as swamp milkweed provide nectar and habitat for butterflies, such as the endangered Monarch. 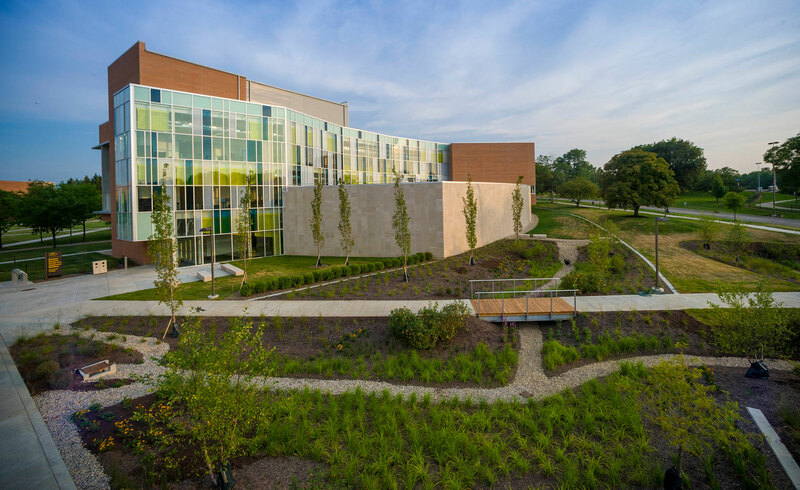 EDGE previously provided site design and landscape architecture to the Rinzler Athletic Complex at Wright State. The project included renovations to the existing soccer stadium and practice fields and an iconic pavilion and plaza that provide gathering areas and spectator viewing. Wright State is engaged in a $150 million fundraising campaign that promises to further elevate the school’s prominence by expanding scholarships, attracting more top-flight faculty and supporting construction of state-of-the-art facilities. Led by Academy Award-winning actor Tom Hanks and Amanda Wright Lane, great grandniece of university namesakes Wilbur and Orville Wright, the campaign has raised more than $121 million so far.